Happy days! My first monograph has just been published! It’s based partly on research undertaken for my doctoral thesis, and partly on research conducted during my time at King’s College London. In essence, the book asks why emotional political actors are so devalued, and how we can make sense of this both theoretically and empirically. “With the rise of both populist parties and social movements in Europe, the role of emotions in politics has once again become key to political debates, and particularly in the Spanish case. Since 2011, the Spanish political landscape has been redrawn. What started as the Indignados movement has now transformed into the party Podemos, which claims to address important deficits in popular representation. By creating space for emotions, the movement and the party have made this a key feature of their political subjectivity. Emotions and affect, however, are often viewed as either purely instrumental to political goals or completely detached from ‘real’ politics. 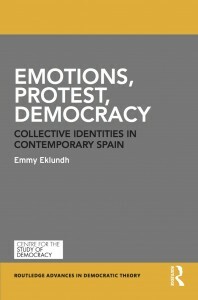 This book argues that the hierarchy between the rational and the emotional works to sediment exclusionary practices in politics, deeming some forms of political expressions more worthy than others. It’s available both as hardcover and as an e-book, whichever takes your fancy! If you want to hear more, come to the book launch at King’s College London on March 20th!